In a sauce pan, add the mint leaves, ginger, sugar and water and simmer for 5 mins, till the sugar gets dissolved. Cool and strain the syrup. Mix the lemon juice, sugar & mint syrup and add the chilled water. Mix well. Pour over ice filled glasses and garnish with a twist of lemon and fresh mint leaves. 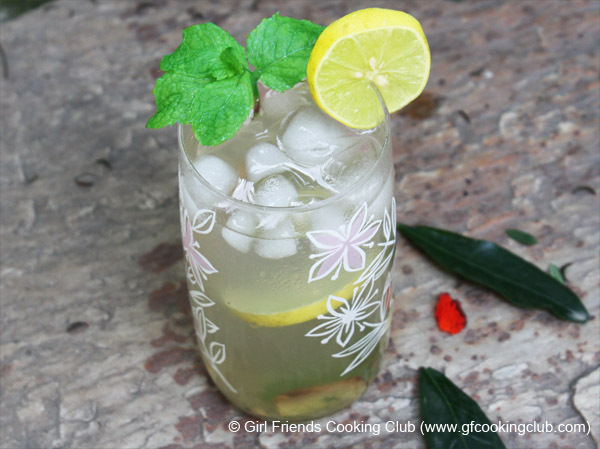 This entry was posted in Drinks, Summer Cocktails and tagged Ginger Mint Lemonade, Summer drink by Kamakshi. Bookmark the permalink.